We’d love your help. Let us know what’s wrong with this preview of Thank You for Coming to Hattiesburg by Todd Barry. Hello. It’s Todd Barry. Yes, the massively famous comedian. I have billions of fans all over the world, so I do my fair share of touring. While I love doing shows in the big cities (New York, P From the veteran comedian and actor from The Wrestler and Louie comes a hilarious book of travel essays from his time on tour through secondary markets in the US, Canada, and Israel. Hello. It’s Todd Barry. Yes, the massively famous comedian. I have billions of fans all over the world, so I do my fair share of touring. While I love doing shows in the big cities (New York, Philadelphia), I also enjoy a good secondary market (Ithaca, Bethlehem). Performing in these smaller places can be great because not all entertainers stop there on tour; they don’t expect to see you. They’re appreciative. They say things like “Thank you for coming to Hattiesburg” as much as they say “Nice show.” And almost every town has their version of a hipster coffee shop, so I can get in my comfort zone. To ask other readers questions about Thank You for Coming to Hattiesburg, please sign up. Might not be for everybody, but Barry's fake bravado and focus on very specific mundane encounters and situations delighted me. I should take a star off for not mentioning the awesome time we had in Oklahoma City, but in a great gesture I gave him slack. 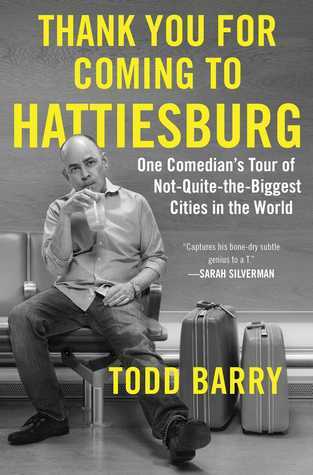 Thank You to Gallery Books for providing me with an advanced copy of Todd Barry's, Thank You for Coming to Hattiesburg: One Comedian's Tour of Not-Quite-The-Biggest Cities in the World, in exchange for an honest review. PLOT- Comedian Todd Barry shares travel notes from his experiences playing secondary markets ( smaller cities/venues), during 2015/2016. LIKE- Previous to reading, Thank You for Coming to Hattiesburg, I had not heard of Todd Barry. 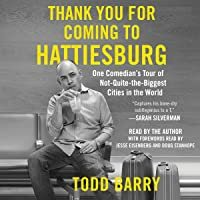 I requested a review copy of his book, because I l Thank You to Gallery Books for providing me with an advanced copy of Todd Barry's, Thank You for Coming to Hattiesburg: One Comedian's Tour of Not-Quite-The-Biggest Cities in the World, in exchange for an honest review. LIKE- Previous to reading, Thank You for Coming to Hattiesburg, I had not heard of Todd Barry. I requested a review copy of his book, because I liked the concept. I like off-the-beaten-path travel logs. I was a clueless about his sense of humor, so I went in with no expectations. I read, Thank You for Coming to Hattiesburg, last night, during my flight from California to Oregon. Would Barry be my ideal travel companion? It was a risk going in without a familiarity with Barry's comedy, but I quickly discovered that we have a similar sense of humor. Barry's quirks and annoyances, like his self-diagnosed Misophonia, had me laughing. As I was currently dealing with air travel, I commiserated with his travel issues, such as a woman trying to guilt him into giving up his aisle seat. The nerve! I enjoyed his behind the scenes perspective of being a traveling comedian, the pains and joys of being on the road. What I most loved about his travel diary, was his recommendations. Hell yes, I'm going to visit the "railroad car/ future home of a corn dog restaurant" in Oklahoma. Cape Fear Serpentarium in North Carolina, I'm coming! Barry's love of local coffee houses and sightseeing is right up my alley. Barry's witty observations reminded me of one of my favorite authors, David Sedaris, who always makes me laugh until I cry, when he reads from his travel diary during his live shows. The funniest stuff comes from observing other people, things too bizarre to make up. DISLIKE- Not so much a dislike, but a suggestion; although, Thank You for Coming to Hattiesburg, is a quick read, don't do it in one sitting. If I had parsed it out, I would have found it more enjoyable. I felt like I rushed it. Don't rush Barry, he deserves better. RECOMMEND- Yes. I'm sure his fans will be delighted, but even as someone with zero familiarity with Barry, I found, Thank You for Coming to Hattiesburg, to be a highly entertaining read. If you're a fan of Todd Barry, you'll enjoy this book. If you love stand-up and the inner-workings of it, you'll enjoy parts of the book. However, if you're looking for something with conflict or anything that drives the narrative/entries, this isn't the book for you. Barry's comedy is subtle and nuanced, which makes it translate well to the written format; other comedians fail in this regard. Barry succeeds. However, much of the short book is bloated with mundane notes about cafes, restaurants, If you're a fan of Todd Barry, you'll enjoy this book. If you love stand-up and the inner-workings of it, you'll enjoy parts of the book. However, if you're looking for something with conflict or anything that drives the narrative/entries, this isn't the book for you. Barry's comedy is subtle and nuanced, which makes it translate well to the written format; other comedians fail in this regard. Barry succeeds. However, much of the short book is bloated with mundane notes about cafes, restaurants, and descriptions of hotels. Sometimes, this is funny. Other times (most times), it's tedious. Barry has a few on-going jokes that string things together, but for the most part, this lacks direction and purpose. I enjoyed it, but a few times I picked it up and read, thinking, "Why am I spending time on this?" And that's coming from a fan. I appreciated the insights in the book, and I loved that Barry showed his personable side. I also like that he--unlike so many comedians--showed his appreciation for the smaller towns, such as Madison's Comedy on State (which is a great club), and other smaller but great venues. Hilarious stories, many featuring chicken fingers. Read it on a plane and went to grab some chicken fingers after landing. For lovers of stand up comedy, specifically Todd Barry's stand up comedy, this book will be very entertaining. Todd's travelogue of 'second-tier' comedy markets around the country was entertaining, and a funny window into the world of Todd's touring life. If you are familiar with Todd's comedy, you'll hear his voice throughout this book, which is tempting me into trying the audiobook, as I'm sure it would be even more entertaining in Todd's dry, deadpan-ish delivery. When I saw "Hattiesburg" in the title and a known comedian as the author, I had to give this one a shot. It's a travelog with a dry wit that mentions The Thirsty Hippo. Where else are you going to find that? Todd's humor translates beautifully to the written word. I literally laughed out loud throughout this hilarious book of travel memories. I also learned quite a bit about sky miles, hotel reward points, and the life of a comedian on the road. Recommended! Quick, breezy, and satisfying. Comedian Todd Barry pens a (somewhat) quirky Travel memoir that follows him through an (intentional) tour of smaller cities and more off the beat towns. He colors it with plenty of jokes about being famous, and he uses the book to draw small, quirky caricatures of each place from the perspective of a performing comedian. Some of it is looking out from the stage (or backstage), and some of it follow him on pre/post performance excursions. It all goes down smooth- ab Quick, breezy, and satisfying. Comedian Todd Barry pens a (somewhat) quirky Travel memoir that follows him through an (intentional) tour of smaller cities and more off the beat towns. He colors it with plenty of jokes about being famous, and he uses the book to draw small, quirky caricatures of each place from the perspective of a performing comedian. Some of it is looking out from the stage (or backstage), and some of it follow him on pre/post performance excursions. It all goes down smooth- about as smooth as a good cup of coffee. Todd Barry is one of my favorite stand-up comedians ever, and this book was really good, funny, and an easy read (and made me legit want to visit a handful of these small cities). The "easy read" thing isn't meant as backhanded compliment, btw. Funny look at the life of a comedian on the road, regularly working crowds of <100, and killing it. And oregano is a pizza topping. This one might be for Todd Barry fans only. It's an interesting mix of (for him) rare earnestness and the usual trademark sarcastic bombast. I liked all of the behind-the-scenes of the business of stand-up comedy, but there was too much small-town tedium overall. Fun, quick read but by no means great. 2 1/2 stars, rounded down to 2. To my knowledge, I'd never heard of Todd Barry. I saw the book on the library shelf, thought the title and subject matter sounded entertaining, and went for it. Based on my read of the title, it seemed like this book would focus on small cities around the country. It actually focuses on Barry's tour -- the venues, the hotel rooms, the promoters, his professional friends, and what he likes to eat -- more than where he is. So really, the subtitle is more descriptive. 2 1/2 stars, rounded down to 2. To my knowledge, I'd never heard of Todd Barry. I saw the book on the library shelf, thought the title and subject matter sounded entertaining, and went for it. Based on my read of the title, it seemed like this book would focus on small cities around the country. It actually focuses on Barry's tour -- the venues, the hotel rooms, the promoters, his professional friends, and what he likes to eat -- more than where he is. So really, the subtitle is more descriptive. I think if you are a Todd Barry fan, you'll probably like this book. The book does kind of make you feel like you're tagging along on his tour. It's just that, his tour doesn't have that many moments of interest. It's like, this is his diary, and it's a rather ordinary account of someone whose job calls for a lot of travel. You know the person who often uses Facebook to share a picture of the meal they're about to eat? That's a big chunk of Barry's book. He tells us what he had for dinner and what he got at the coffee shop. He tells us he had a good hotel room or a problematic one. The promoter was a real stand-up guy, or he stiffed him. The greenroom lacked toilet facilities or it didn't. And so on. On the plus side, his comments about his craft are interesting. Different types of audiences, what makes for a good venue or a bad one, how to work with warm-up acts, and so on. And he does share some nuggets about the towns and cities he visits. A few other good things: The chapters are short and so the book has a good pace. There is little to no gratuitous vulgarity. The tone of the book is mostly positive. The political content is virtually nil. never heard of him, but if he were performing quite near my house I'd go listen. He seems funny, observant, and overall a decent guy. That said, I'm not sure this was really an idea for a whole book. It's a travelogue, with each short chapter corresponding to one of the stops on his tour. Says stuff that is likely funny if you're there with him in the hotel, coffee shop, whatever, but usually not hilarious if you are not. One of the stylistic quirks is to interject speculation about how the reade never heard of him, but if he were performing quite near my house I'd go listen. He seems funny, observant, and overall a decent guy. That said, I'm not sure this was really an idea for a whole book. It's a travelogue, with each short chapter corresponding to one of the stops on his tour. Says stuff that is likely funny if you're there with him in the hotel, coffee shop, whatever, but usually not hilarious if you are not. One of the stylistic quirks is to interject speculation about how the reader is reacting or how a conversation might have gone if he had spoken up to the person, etc. A tone of mock boasting about his fame and success permeates a high percentage of the anecdotes. There's one for instance about turning in an iPad someone had left in a coffee shop, concluding with "half the reason I'm writing this book is to get the 'I turned in someone's iPad' story to the wider audience it deserves"
some of the variance in enjoyment of observational comedy is of course whether you can relate to it -- when he self-discloses his misophonia and complains about people who whistle, I am so on it! When he's kvetching about the sauces offered for his chicken fingers or whatever, i'm flipping the pages. But I don't want to be completely noncommital, so I offer up a Todd Barry enjoyment test for you. "....witnessed the most unnecessarily polite conversation I've ever seen. It started when an employee walked over to a guy sitting near me and cleared his empty mug. 'oh, I'm sorry I didn't do that' the sitting man said. 'I was coming around to pick up mugs anyway' the barista responded. They went back and forth on this a few times, then the barista walked away. He came back and added 'Yeah, we're trying to get better about clearing the tables.' I was like "Fellas, it's okay! He was about to clear his mug, but you were walking by to clear mugs anyway. If you keep this going this can only evolve into a brawl!" They say "never meet your heroes". I will add to that "Never read your comedy hero's books". Why is it so many VERY funny comedians cannot for the life of them write an entertaining book? It is why I treasure the few that can (Tina Fey, David Spade). Todd Barry, a very funny comedian, phoned this one in. This reads like the blog from a 16 year old. I had read one review saying, in effect, "he talks about coffee a lot" . This is not an exaggeration. The book is basically Todd's first (and only) t They say "never meet your heroes". I will add to that "Never read your comedy hero's books". Why is it so many VERY funny comedians cannot for the life of them write an entertaining book? It is why I treasure the few that can (Tina Fey, David Spade). Todd Barry, a very funny comedian, phoned this one in. This reads like the blog from a 16 year old. I had read one review saying, in effect, "he talks about coffee a lot" . This is not an exaggeration. The book is basically Todd's first (and only) thoughts on the 40ish cities he visited during the year. He literally gives no thought to anything he writes and just fills it with anything that comes to his mind. Since he likes coffee we get to read about the name of every coffee shop he visits. No story. Just "I went to this coffee shop and saw the busboy clear off some mugs." "After the hot dog Jennifer indulged my biggest road pleasure: finding a Chase Bank ATM where I can deposit my previous night's pay." I know this is supposed to read as dry wit but it falls flat when it has been preceded by 1000 other sentences of a similar dry wit. Mostly we learn Todd is very aware of money, is easily insulted or offended by everyone, and demands to change hotel rooms when he doesn't like the one he is in. I think what I am most upset by is that the entire book smacks of "no effort". Whatever the first thought that popped into Todd's head when he read over his notes for a gig is the first thing he writes. There is very little humour and no interesting stories. So, while I ended up not being a great fan of his other work (just a matter of taste rather than quality), this film inspired me to find Todd's book. It turned out to be an enjoyable summer read with plenty of insights into a world foreign to me, namely that of touring comedians. As a collection of humorous road stories, it was often very funny. It also granted plenty of insights into the personality of the author, mainly through the revelation of his own idiosyncrasies. Relatively short, but enjoyable. It's impossible to read it without hearing Todd's voice in your head; his comedy works almost as well on paper as his actual standup. I kept wishing it was a bit more fleshed out though; so many potentially interesting topics get little more than a single sentence, or a paragraph at most. He also tends to complain about mundane things a lot (and he seemingly asks for a new room at every hotel he goes to), but I guess that's just the way life goes when you're a sup Relatively short, but enjoyable. It's impossible to read it without hearing Todd's voice in your head; his comedy works almost as well on paper as his actual standup. I kept wishing it was a bit more fleshed out though; so many potentially interesting topics get little more than a single sentence, or a paragraph at most. He also tends to complain about mundane things a lot (and he seemingly asks for a new room at every hotel he goes to), but I guess that's just the way life goes when you're a super famous, world-renowned, stand-up comedy genius. It also ends quite abruptly, but he jokes about that to smooth it over. 1) I love Todd Barry’s standup. 2) I love learning about obscure off the beaten path cities that no one visits. 3) I love learning about the details of different jobs. 1)	I love Todd Barry’s standup. 2)	I love learning about obscure off the beaten path cities that no one visits. 3)	I love learning about the details of different jobs. For these reasons, this book immediately appealed to me. Todd’s dry delivery actually translates pretty well to the written word and you get to spend a couple days feeling like you’re hanging out with him as he tours America’s secondary market. The whole book reads like a travelogue where Todd expands on brief notes he wrote during the course of the tour. There’s no grand arc or message but it’s fun. Each chapter covers one city and is only a couple pages long. The format gets a little repetitive about halfway through but every city has at least a couple amusing anecdotes that make it worth finishing. I’m glad I read it and I’m glad Todd Barry wrote it. Another billion dollar success from one of the biggest names in stand-up. Todd Barry is a hilarious, sweet and mellow comedian. Todd Barry is also very generous: instead of selling out Madison Square Garden several times in a row, he mostly does small venues around the country. With this book you can follow him around and see what a touring comedian encounters, both on stage, off-stage and around these tiny towns. It's a funny and delightful book, with many cute interactions and observations, fu Another billion dollar success from one of the biggest names in stand-up. Todd Barry is a hilarious, sweet and mellow comedian. If you enjoy the over-the-top verbal pyrotechnics of Todd Barry's live shows, just wait until you experience his energy in written form: black-and-white, static on a page. Barry's stories are so intoxicating, the reader must manage his energy through to completion, lest he require an Ambien and a bottle of merlot to bring himself down from this frenzy o' droll. I'm just kidding. It's like Kerouac on cough syrup. And it's delicious. I'm a big fan of stand up comedy and of Todd Barry in particular, so I enjoyed this a lot. He actually mentioned a show I saw him at in the book (Oddball comedy festival at Jones Beach). The book is just as dry and hilarious as his stand up. I could imagine the inflection of his voice in my head while I was reading. Read if you're interested in stand up, food, travel, etc. I had never heard of Todd Barry going into this book, and the first few chapters were great. If you are a fan of his, perhaps this books odd and slow pacing is perfect for you. If you are not, I would suggest doing more research and then seeing if it is still in your interest. There is a lot of potential that is wasted time and time again here, but that seems to be his gimmick. If you find that funny, you will enjoy the book. I thought it was funny, but I kept wishing for more funny lines than I got.